These delicious apple chips are actually really easy to make! Use a mandolin (or a steady hand) to slice your apples very thin. Mix spices with sugar and sprinkle on the apple pieces. Bake them for two hours in a 250 degree oven, flipping half way through. The sugar is completely optional and your children might not even notice if you leave it out. 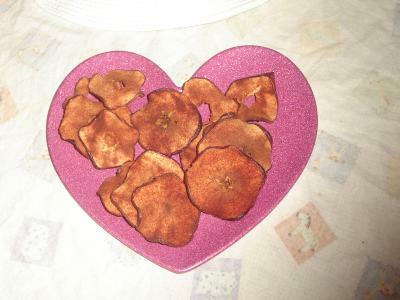 Red delicious apples don’t dehydrate well, so experiment with what apples you like as chips. Great as a healthy snack for Thanksgiving instead of potato chips.